Some of the key influences affecting global seaborne dry bulk commodity trade became less supportive during the past twelve months. Consequently, trade growth was not maintained at the brisk expansion rate seen in the previous few years. A deceleration emerged, and signs appearing recently suggest that this slowing tendency could continue through 2015. The performance of dry bulk trade as a whole last year was relatively healthy, however, compared with global economic activity, an important influence. Provisional calculations point to world seaborne dry commodity movements increasing by around 3.5% in 2014, following 6–7% annual rises in each of the preceding three years. Currently a similar, perhaps slightly reduced increase of about 3% looks possible in 2015.
impact on import demand for commodities — the European Union, Japan and China — saw either sluggish performances or, in the case of China, a persistent slackening trend. Against this background, some negative effects on seaborne trade were clearly discernible. But dry bulk trade benefited in the past twelve months from more specific factors, especially additional iron ore cargoes which contributed a large part of the overall growth. Conversely, the coal picture was not so positive, and some tentative estimates suggest that seaborne coal trade declined marginally. In the year ahead there are expectations for a continued outperformance by iron ore movements, accompanied by modest extra impetus in several other sectors. Uncertainty and anxiety about global economic growth prospects intensified last year, as it became clearer that an improving trend was not becoming firmly established. At year end, however, it seemed possible to envisage a boost during 2015 from the unexpected sharp fall in oil prices which had taken place. Although not advantageous to all countries, some could be strengthened. Organisation for Economic Cooperation and Development estimates, published at the end of November, pointed to only a limited improvement in economic activity during 2014 as a whole, preceding a further modest acceleration in the current year. As shown in table 1, GDP growth in the OECD area — advanced countries mainly comprising the EU, USA, Japan and Korea — was estimated at 1.8% last year, following 1.4% in the previous twelve months. In 2015, 2.3% growth is envisaged. The OECD’s assessment of prospects concluded that “growth is expected to remain modest by past norms”. Nevertheless, a gradual strengthening over the next two years seemed foreseeable, assuming that there is no intensification of the prevailing uncertainty, and also assuming that the downside risks do not materialize. Goods and services output (GDP) could be expected to gain momentum, assisted by supportive monetary policies. But the EU’s weakness has become more of a concern, emphasized by a poor performance during 2014 when widespread expectations of a slight pickup proved over- optimistic. Moreover, the risks of persistent stagnation appeared to multiply. Although several influences are expected to assist recovery over the next 12 months, disinflationary pressures are evident. Forecasts suggest that GDP in the eurozone during 2015 may reach only about 1%. Japan’s economy entered a ‘technical’ recession last year, with two declining GDP quarters, immediately after sales tax was introduced in the spring. It was another example of progress falling short of many expectations, which had been raised by the success of ‘Abenomics’, the prime minister’s strategy for reviving economic activity. In the year ahead, forecasts indicate low or minimal growth at around or under 1%. In China, economic output has been growing at a less rapid pace than seen previously, but the slowdown is consistent with signs of a longer-term slowing trend. Government policy has envisaged this pattern, amid intentions to shift the balance away from capital investment and exports, and towards consumer spending. GDP growth in 2014 below the preceding year’s 7.7% could be followed by further deceleration towards 7% in 2015. For numerous economies, upside potential is created by the dramatic oil- price fall recently. Some countries could gain substantial benefits, based on a similar impact to that of a tax cut, resulting in increased spending and strengthening economic activity. But there are many complicating factors and offsets, so a huge boost is not guaranteed. Also, the size of additional impetus provided depends upon how long the reduction persists, its average magnitude, and expectations for future oil prices, none of which is easy to predict. Patterns of spending shaping economic activity are key influences affecting steel demand and production. In countries purchasing foreign supplies of raw materials, changes in steel output are linked to iron ore and coking coal import volumes. In the past twelve months, many large steel producing countries saw flat or slightly increased production volumes. Recent World Steel Association estimates highlighted changes in steel demand, increases or decreases in which are not always the same as actual production variations. For 2014, EU domestic steel demand was expected to be about 4% higher than seen in the previous twelve months, while in Japan a 2% rise seemed to be evolving. China’s earlier strong trend appeared to have ended, with a marginal 1% advance estimated. Signs indicating how 2015 steel demand would unfold suggested no improvement compared with last year’s estimated outcomes. The WSA foresaw a slightly reduced 3% growth rate in the EU this year, amid weak economic growth and possibly a small 1% contraction in Japan, reflecting a fading impact from government economic policy changes. China’s receding property market and switching emphasis towards rebalancing the economy was expected to result in minimal, less than 1%, growth in steel demand. The steel industry’s main raw materials movements, iron ore and coking coal, comprise one-third of all global seaborne dry bulk commodity trade. Last year iron ore trade apparently grew by about 9%, based on partial information, reaching over 1,310mt (million tonnes), as shown by table 2. Coking coal trade may have been about 2% higher, at 310mt. large increase in iron ore trade could result mainly from further expansion of China’s import demand, accompanied by some limited positive changes elsewhere. Coking coal movements could benefit from higher purchases by Indian importers and other buyers. Iron ore imports into China expanded rapidly over the past twelve months. Steel production growth receded, but substitution of domestic iron ore supplies by foreign purchases benefited import volumes. Much lower international iron ore prices greatly improved the relative attractiveness of ore supplied from foreign mines, especially Australia’s greatly increased output. China’s iron ore import requirements dominate global seaborne iron ore trade, comprising more than two-thirds of the total. After reaching 820mt in 2013, estimates pointed to at least a 10% rise in the past year, possibly followed by another big increase during 2015. This expectation reflects an assumption that competitively-priced supplies, from foreign sources, will continue displacing an enlarging portion of higher- cost production from Chinese domestic mines. Positive changes in the remaining one-third of iron ore trade may be limited. The major importing countries of Europe, Japan and South Korea could see subdued growth in purchases if positive steel demand developments result in production growing as well. Additional iron ore imports into India also are a possibility, given the constraints affecting domestic mines’ output amid rising usage resulting from rising steel production. Coking coal seaborne trade is not dominated by China, as seen in the iron ore sector. 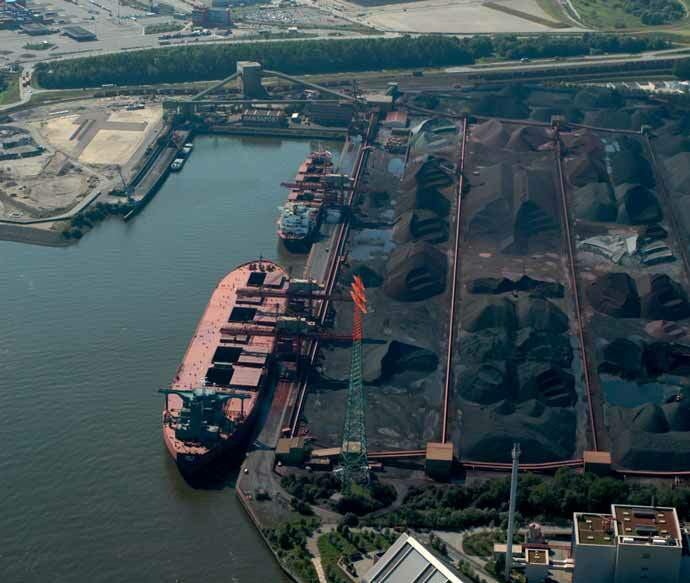 Another feature is that global coking coal movements are much smaller than iron ore shipments. Although China is a large coking coal importer, Japan and the European Union are equally big buyers and India is catching up, so the global trade breakdown by importing country is more evenly distributed. Provisional estimates for 2014 suggest that China’s coking coal imports fell, compared with the previous year. By contrast, India’s volume apparently rose sharply, while South Korea also seems to have raised its annual requirements. Japan’s quantity may have been slightly lower while Europe’s rose.This year, a number of major importers may see increases, but China’s trend is more difficult to predict. Trade in steam (or thermal) coal, used chiefly in power stations but also in the cement and other industries, forms a much larger part of overall coal trade than coking coal. Seaborne trade in steam coal, which had been growing vigorously, apparently saw only a marginal increase in 2014, compared with the previous year’s 890mt volume. coal-fired generation capacity is expanding is a positive influence. Growing reliance on foreign supplies of coal, resulting from these trends, contributes to the favourable picture, sometimes assisted by inadequate domestic coal production. However, environmental concerns about coal burning have become increasingly prominent, leading to political interventions to curb coal use, such as those seen in Europe and China. This pattern, in turn, often limits potential for imports growth or reverses upwards trends. Switching to cleaner fuels is likely to remain an objective in many countries although, elsewhere, the economic advantages of coal remain compelling. Prospects for steam coal import demand growth are most evident among Asian countries. The two biggest regional importers are India and China, both of which continue to enlarge their coal-fired power generation capacity. But, last year, foreign coal purchasing patterns diverged: India’s trend remained positive, while China’s turned negative. Rising steam coal imports into India reflect power plant additions and growing electricity output. Several massive new power stations are being built at coastal locations, adding to potential future consumption and imports growth. Supply shortfalls in the huge domestic mining industry and inadequate rail capacity are also factors. Steam coal imports may have grown by over 15% last year, from 144mt in the previous period, and probably will increase again in 2015. China’s steam coal imports.trend is now surrounded by greater uncertainty.Adverse influences have become prominent, especially steps aimed at reducing air pollution in cities. The upwards trend in domestic coal production slackened last year. Hydro-electricity output was higher. Amid coal market weakness, imports of steam coal were sharply down compared with the previous year’s 252mt (including low-grade lignite). imports. In Japan, an eventual return of activity in the huge nuclear power sector, which remains closed following the Fukushima accident four years ago, could reduce coal’s contribution. Global seaborne grain, oilseeds and other bulk agricultural commodity trade is often determined, at least in the short term, largely by the effects of changing weather patterns. These changes greatly affect domestic crops in importing countries (with implications for import levels), as well as influencing harvests in exporting countries. Underlying consumption trends are a longer-term factor. During the past 12 months, world seaborne grain trade (usually defined as comprising wheat, corn and other coarse grains, plus soyabeans) was affected by sharply contrasting influences. First half 2014 trade movements saw a continuation of the events seen in the previous six months, when a strong expansion started. After mid-2014, this positive pattern faltered, and signs of weakness began to emerge. Crop year figures illustrate clearly how movements are evolving. Recent International Grains Council figures suggest that world trade in wheat and coarse grains (but excluding soya) could decrease by about 10mt or 3% in crop year 2014/15 ending June 2015, to 297mt. In the previous 12 months a large 14% increase was seen. In 2013/14 the rapid surge was caused by a widely-spread global import demand expansion, spurred by lower international grain prices. About one-quarter of the overall increment was caused by China’s almost doubled volume. The balance comprised higher purchases by other Asian countries, the Middle East area, North Africa, Europe and elsewhere. Within the current 2014/15 year, recent good harvests in several importing countries may be reflected in lower foreign grain purchases. EU imports are likely to fall sharply for this reason, while volumes into China and North Africa could be lower, partly offset by an increase in the Middle East. The EU’s total could be down by 40%, to 12mt, following another large harvest in mid-2014, substantially reducing feedgrain (livestock feed) import requirements. Abundant domestic grain availability in China is set to have negative effects on imports. Although the latest summer/autumn Chinese harvest was no higher than the previous year’s output, it was sufficient to keep the market well supplied. Coupled with apparently adequate stocks, pressure from rising usage trends has become less intense, implying an imports decrease, based on IGC estimates, of 29% to under 14mt. A differing evolution is unfolding in the soyabeans sub-sector. After growing strongly by 15% in the 2013/14 marketing year ending September, US Dept of Agriculture calculations point to another increase, albeit much slower at 2%, to 113mt in 2014/15. Continuing expansion of China’s import demand provides a large part of the impetus for rising global soyabeans trade. After increasing by 18% in 2013/14, Chinese purchases could rise by 5% within the current year, reaching 74mt. Expanding consumption is the main explanation, both soyameal usage in livestock feed and soyaoil usage in food manufacturing and home cooking. Lower domestic soyabeans production is also a contributory influence. The outlook for grain and soya trade later in 2015 is still hazy. Domestic crops in northern hemisphere importing countries’ mid-2015 grain harvests will be a large factor determining foreign purchases. But these harvests are not yet predictable, because weather conditions over the growing season cannot be forecast accurately. An extensive category, the minor bulks sector is comprised of many commodity trades, some of which individually are large. The diverse range comprises cargo movements related to industrial and construction activity, while agricultural commodities are also significant. Altogether this group provides one-third of total seaborne dry bulk trade. The most prominent elements within the ‘industrial’ sub- group are steel products and forest products. Other large parts are bauxite/alumina, iron and steel scrap, cement, salt, petcoke, plus nickel and other ores. Among ‘agricultural’ minor commodities are sugar, rice, oilseed meals, phosphate rock, other fertilizer raw materials and semi-processed fertilizer products. Last year, based on tentative calculations, growth in the entire minor bulks group may have been minimal. This outcome followed a robust performance in the preceding twelve months, when total seaborne trade reached around 1,500mt, as shown in table 2. In 2015, an upwards trend may resume. Changes in individual commodity trades are often linked to specific factors, but broader economic growth patterns are also relevant. During 2014, import demand for industrial minor commodities was limited, in a number of countries (in Europe, for instance), by subdued economic progress with unfavourable implications for manufacturing and construction activity. In many minor bulk trades, global trends are closely related to China’s import demand. Chinese buyers of bauxite/alumina and nickel/other ores influence high proportions of world movements. In 2014 Indonesia’s ban on unprocessed mineral exports (extensively shipped to China) caused trade in some minor bulks to diminish. World seaborne bauxite/alumina movements apparently declined sharply last year from around 140mt in the previous twelve months. Reduced imports into China was the main reason. This downturn resulted from buyers earlier anticipating Indonesia’s export ban and consequently raising their stocks, followed by the ban’s adverse effects when introduced at the start of last year. The slowing of the Chinese economy, together with falls in the price of many of the commodities which are crucial to Brazil, means prospects for 2015 are less good than for a decade, writes Patrick Knight. Brazil has benefited enormously from the fast growth of the Chinese economy during the past ten years. Strong growth in demand for most of the commodities it exports, with iron ore and soya beans in the lead, but also including market pulp, timber, leather, alumina and cotton, and with maize an important newcomer in recent years, have meant Brazil has earned more from its exports than imports have cost. The recent slow down in the Chinese economy, which has caused imports to fall sharply in the past few months, means exports to China will earn much less this year than they did in 2014. This will cut the profits of miners and farmers, which is likely to cause output and exports to fall in the next few months, possibly for years. process. In the past couple of years, China has been Brazil’s leading market, as well as the main source of what it imports. The export of commodities, both hard and soft, have been responsible for more than half of all Brazil’s export total earnings in recent years, and have guaranteed a surplus in visible trade for several years. For more than a decade, the Chinese economy grew by more than 10% a year. Growth was spurred by massive spending on infrastructure works, as well as construction of all kinds, which resulted in the country becoming the world’s leading manufacturer of steel. The migration of tens of millions of people from the countryside to cities each year, led to a surge in demand for a many foodstuffs, notably grains, oilseeds, meats and dairy produce. Much of the extra feed and food came from Brazil. China has had to abandon its long term policy of being entirely self sufficient in food. With limited supplies of land and water available, there is no going back on this. With growth in China now in single figures, and the news that rather than growing, as they have done for many years, imports fell in 2014, the price of most commodities, which fell in 2014, can be expected to tumble further this year. The price of iron ore, which had neared $100 per tonne in several years, averaged only just over $80 per tonne in 2014. Many expect the ore price to fall to little more than $50 per tonne later this year and to remain there for several years. While demand for ore is falling, supply continues to increase. This is because most of the world’s largest mining companies all embarked on massive expansion projects aimed at increasing supply by up to 50%. Despite the risk of oversupply, the mining companies felt that if the price of ore fell by enough, many mines in China, where production cost are well above average, would be forced to close down. This would allow the price of ore from Brazil and Australia, which is better quality than what exists in China, to recover. But the expected mine closures in China have not occurred and although some mines there may eventually be shut down, a reduction in the supply of Chinese ore may not come soon enough to prevent the profits of miners such asVale,Anglo American, Billiton and Rio Tinto, from falling sharply. Another worry for the miners, is that the supply of scrap steel in China, which has been negligible until now, is beginning to increase, as many more cars and consumer durables reach the end of their useful life. This will allow much more scrap to be used to make steel, resulting in demand for iron ore to slow. This has already happened in the United States, Japan and many European countries, which all import far less iron ore than in the past. Vale has already announced that it will slash spending both at its Carajas complex, where output was due to almost double to 200mt (million tonnes) by about 2018, as well as in the higher cost mines in Minas Gerais state, whose ore is shipped from terminals such as Tubarao in Espirito Santo state. The Anglo American company, which made its first experimental shipments of ore from its newly opened mine in Minas Gerais state in October, the ore taken in slurry form along a 500km pipeline, is unlikely to ship the 12mt or so promised for this year, as demand slows and competition increases. Several of Brazil’s steel companies, hit by low prices of steel and weaker than anticipated demand on the domestic market, had switched from buying most of their ore from Vale, to using ore from their own reserves in the past few years. Some of them, notably the National Steel Company, the CSN, often earned more from the export of their ore, than from the sale of steel. With the price of ore down sharply, Vale will give more emphasis to the domestic market, virtually abandoned in the past few years of soaring world ore prices. This may prove a major challenge to the steel companies, whose mines are mostly higher cost than those of Vale. The impact of the slowdown in China, coupled with the continued stagnation of most countries in Europe, has affected the iron ore market faster and more dramatically than that of most soft commodities. Work on building new railways, roads and apartment blocs can easily be brought to a halt or slowed. But people continue to need to eat, while the populations of numerous large countries notably in Asia continues to grow, while more continue to move to cities, where they eat better than in the countryside. The price of several soft commodities, notably soya and maize, as well as sugar and wheat, have fallen steadily in the past few months, which has benefited consumers. The lower price of grains is mainly because farmers in many countries around the world responded to several years of high prices and increased plantings. Many also improved plantation care, notably by using more fertilizer and farm chemicals. This all adds to cost, but allows yields to rise. If farmers margins continue to be squeezed, however, this process may be reversed, although it will take some time to come about. Several years of high profits allowed the tens of thousands of farmers who grow soya in Brazil, to pay off debts accumulated when they bought more land, which resulted in the planted area increasing by up to 4% each year for many years. Disregarding the fact that prices have now started to slip, and trusting that as happened so often in the past, prices will recovered later in the year, farmers who plant soya and maize in leading producing state Mato Grosso, 2,000km from the nearest port, are expected to produce up to 4mt more soya this year than in 2014. The 2014/15 soya crop could total more than 95mt, which will help push up world stocks to record levels, inevitably causing prices to fall further. While on the one hand prices continue to fall, while on the other, costs, notably of transport, continue to rise, so many farmers may come to regret the decision to plant much more 2014/15. Many farmers are already complaining that they will make losses this year and it remains to be seen how long their financial reserves will last, before farmers are forced to cut plantings, as well as reduce plantation care. This will mean less fertilizer will be both used and imported. Approximately 50mt of soya beans will be exported from Brazil this year, 4mt more than in 2014. The price of beans is expected to average about $370 per tonne, compared with the $510 per tonne for the beans exported last year. As a result of the lower prices, the soya beans, meal and oil to be exported this year is on course to earn between $23–24 billion, almost 25% less than the $30 billion the export of soya products earnedin2014. Thedifferencewillbesorelymissedbyboth farmers and traders, although to a lesser degree by the shipping companies, who will carry more. The lower earnings from soya and maize exports will make a big dent in Brazil’s export earnings this year. The trade account will almost certainly slip into the red as a result, as soya is Brazil’s leading export earner, followed by iron ore, which will contribute less. On the positive side, 3mt of soya products, the majority beans, were shipped from ports in the north and north east of the country last year. More than a million tonnes were taken to ports close to the mouth of the Amazon along the river Tapajos from close to where it was grown in Mato Grosso state for the first time. But almost 3mt will use two new terminals started up by Bunge in 2014. Getting beans from farms to ports in the north using a combination of road and water, costs about $100 per tonne. This compares with the $150 it costs to take a tonne of beans by truck to Santos or Paranagua along precarious and congested roads. The ports in the north and north east of Brazil are also three to four fewer days sailing time to leading destination China, than from ports such as Santos and Paranagua, so further savings are being achieved because of this. What happens to the Brazilian currency, the Real, helps determine both demand and prices. A weak currency has worked in favour of farmers and miners in the past few months, when the Real fell by up to 25% against the $US dollar. Brazilian farmers and miners were fortunate that the price of most of the commodities it exports were above average during the period when the Real was relatively strong, relative to the $US dollar. This meant their earnings were protected. such as fertilizer, of which almost 30mt is used, 70% of it imported, will cost more from now on. This means farmers can be expected to use less fertilizer from now on, which will be reflected in lower yields in the years to come. For the time being at least, demand for the bauxite and alumina of which Brazil is one of the world’s leading producers and exporters, have not slowed significantly as a result of the slow down in China. But the situation is much less positive for the companies which use alumina to make primary aluminium in Brazil. No new aluminium smelter has been built in Brazil for 25 years, while the amount of aluminium consumed there has been growing steadily, with more having to be imported each year. The main reason the for smelters reluctance to invest, has been the relatively high price of electricity in Brazil, far higher that in almost all the other aluminium producing countries. The exceptionally dry weather which damaged both the sugar and the grains crop in many parts of Brazil last year, resulted in water levels at most of the lakes which power hydro-electric power stations falling so low as to oblige the authorities to start up the much higher cost gas and coal fired plants during all last year, instead of just at times of peak demand. The high cost of running these "thermal" plants non stop, means that the cost of electricity will rise by at least 25% this year, and could rise further next. Lakes are still dangerously low, so will take several years to recover. Brazil looks certain to have to import increasing amounts of aluminium this year, even though with the economy unlikely to grow for the second year running and key industries, notably the motor industry, is set to produce fewer units.